Michael Lewis has a long article reporting the story of the rise and fall of AIG, the institution that over the course of a single day — Monday, September 15, 2008 — faced collateral calls on its derivatives portfolio in excess of $80 billion. We're talking about the heart of the financial storm: the infamous AIG Financial Products unit — and Lewis is here to explain it, in his usual engaging style. He spends a good portion of the article examining the character of Joe Cassano, the AIG executive who oversaw the Financial Products office during the crucial years. There are some fascinating conjectures in this discussion, but I think that for all the interest in Cassano's "cartoon despotism," the real story is this: What Lewis is describing is usury. "Financial risk had been created, out of thin air, and it begged to be either honestly accounted for or disguised." "There was a natural role for a blue-chip corporation with the highest credit rating to stand in the middle of swaps and long-term options and the other risk-spawning innovations. The traits required of this corporation were that it not be a bank — and thus subject to bank regulation and the need to reserve capital against the risky assets — and that it be willing and able to bury exotic risks on its balance sheet. There was no real reason that company had to be A.I.G. ; it could have been any AAA-rated entity with a huge balance sheet. Berkshire Hathaway, for instance, or General Electric. A.I.G. just got there first." "In a financial system that was rapidly generating complicated risks, A.I.G. F.P. became a huge swallower of those risks . . . Its success bred imitators: Zurich Re F.P., Swiss Re F.P., Credit Suisse F.P., Gen Re F.P. All of these places were central to what happened in the last two decades; without them the new risks being created would have had no place to hide, but would have remained in full view of bank regulators. All of these places have been washed away by the general nausea now felt in the presence of complicated financial risks, but there was a moment when their existence seemed cartographically necessary to the financial world. And A.I.G. F.P. was the model for them all." "Here is an amazing fact: nearly a year after perhaps the most sensational corporate collapse in the history of finance, a collapse that, without the intervention of the government, would have led to the bankruptcy of every major American financial institution, plus a lot of foreign ones, too, A.I.G.’s losses and the trades that led to them still haven’t been properly explained. How did they happen? Unlike, say, Bernie Madoff’s pyramid scheme, they don’t seem to have been raw theft. They may have been an outrageous departure from financial norms, but, if so, why hasn’t anyone in the place been charged with a crime? How did an insurance company become so entangled in the sophisticated end of Wall Street and wind up the fool at the poker table? How could the U.S. government simply hand over $54 billion in taxpayer dollars to Goldman Sachs and Merrill Lynch and all the rest to make good on the subprime insurance A.I.G. F.P. had sold to them — especially after Goldman Sachs was coming out and saying that it had hedged itself by betting against A.I.G.?" Lewis is saying that in this mess we have encountered a new sort of vice and malfeasance. It is probably not as simple as calling it fraud like any other, case closed. We may need new conceptual tools and tool terminology. I would only record the codicil that what we have encountered is not new but rather very old. The raw material used in the operation of this malfeasance may have been, as they say, cutting edge, but like so much that appears to modern eyes newfangled and progressive, this was merely a renovation of ancient folly. The modern age verily excels at this sort of thing, reviving bad ideas that are very old under the seductive pretense that they are shiny and new. So we have revived usury, adorned with all the sophistication of rocket science finance. But there is no sophistry by which financial risk can be neatly whisked from the scene. There is no mathematical formula by which it can be packaged tightly away and forgotten about. To think that way is to enter into the utter folly of what F. A. Hayek famously called simply planning. This is the nostrum, often propounded by postwar Socialists, that it is possible for the minds of of experts to compass the whole of the economy, replacing their expertise for the welter of individual decision-making and thereby removing ruinous economic uncertainty. We know now that Capitalists have indulged this insidious error systematically as well, in their case imagining that the expertise and math genius of the "quants" can similarly conquer the uncertainty of the world. They did not set out to defraud people, but they committed a terrible mistake. The Usurers were utopians, and their planning, like that of the Socialists, threatens the prosperity of the Republic. 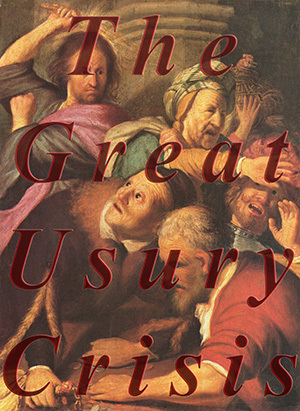 One of the advantages of the term usury, from my perspective, is that, rightly understood, it provides us with a word to describe this folly, this intellectual hubris and its concurrent malfeasance, that does not require us to accuse, well, basically everyone at AIGFP, and every other financial products unit, of deliberate fraud. But neither does it require us to let them off the hook. It short, it provides us with a middle road between populist demonizing of the bankers and defending what they did. Both of these extremes, it seems to me, are deeply imprudent political postures to take. For one thing the bankers were not alone in the wild optimism that drove this speculative boom. The whole Republic was part of the exuberance. Both parties, dozens of industries, quacks and thoughtful men alike; the common wisdom for years has been to encourage this notion of housing as forever destined to gain equity value. On Wall Street the reckless and morbid optimism spread to this peculiar form of Hayekian planning in shadow banking, but the underlying optimism was very widely shared. We revived an ancient but very bad idea, thinking it something new and wonderful and invincible. Not just the i-bankers. Not just the sub-prime mortgage crew. Not just the ratings agencies. Not just the speculators. Not just the CRA pushers. The plutocracy was the main benefactor of this folly, but the fact is our usury has been a very democratic one indeed. We have to face the fact that we built up a usurious economy and have now witnessed its precipitous collapse, leaving us in quite a predicament. * With apologies to GKC. I have little doubt that on some level their folly was indeed some one or another of the ancient evils that we have already named. "There is nothing new under the sun" is itself an ancient saying, after all. And I may yet be persuaded that "usury" is the right term. But so far I don't see it. Generally, in usury someone is squeezed into paying excessive interest. Who in this scenario paid that excessive interest? The borrower? During the pertinent time frames, the interest rates were, broadly, the lowest in 25 years and trending downward. So who paid this excessive interest? By and large, the person who was victimized was the shareholder of one of the now defunct firms that litter the landscape - Lehman, for example. But those shareholders were riskers, gamblers. They did pay excessive interest. It was either usury or gambling. In either case, it consisted of large private gains without a corresponding public benefit. Moreover, it channeled the resources of a great many productive people into the unproductive gimicky "financial engineering." Lewis is excellent as always, and his speculation that all of this ruin could have been avoided, but for the power invested in 1 man and the decisions and emotional make-up of Joe Cassano is hair-raising. Not sure I agree, but Lewis always keeps the individual front and center in the moral drama known as life and is able to penetrate past the layers of abstraction and obscure structures. As an aside, I know Lewis is best know for Liar's Poker and Moneyball, but Coach: Lessons on the Game of Life is a classic and essential reading for any adult who aspires to coach, mentor or instruct young people, and should be required as part of the certification process in every youth sports program worthy of those being served. While excessive interest was not the technical culprit, what do we call financial instruments designed to lure folks into mortgages they won't be able to afford once rates adjust upward, or induce individuals and institutions to hedge against bets they normally wouldn't place with reserves and protections that do not exist? When we prefer to deal in transactions rather than relationships, and when the benefit or welfare of the other person is subordinate to calculations of material self-interest, we are sowing the seeds of destruction. That is not moralism, but an inescapable fact of life and why we need to recover a better understanding of the nature of work and the role it plays in forging our spiritual destiny. schemers they can be. They are negative sum games to an extreme. sold on the value of the limited liability corporation. ridiculous backing by the Treasury of AIG and thereby Goldman Sachs. American capitalists like Henry Ford and Rockefeller. Snake-oil salesmanship? Is snake-oil salesmanship usury? What do we call it when a person lured into these mortgages, refuses to ask: "what do I do when the interest rate goes up? ", blinds himself so he can refuse to consider the implications of the terms as written, and expects others to look out for his interests when he won't do it for himself. Greed, perhaps? or induce individuals and institutions to hedge against bets they normally wouldn't place with reserves and protections that do not exist? It is the fact that the AIGs of the world were pretending that these instruments were worthy of being treated as something more like good mortgages, and not like junk bonds, AND the willingness of others to close their eyes and pretend that "well, if AIG backs it, who am I to say this is risky business?" as if the investor had no obligation to inquire and investigate whether AIG had any reasonable basis for backing it - it is these that led to the fiasco. In both cases, greed led these individuals and groups to theei pretenses and intentional blindness. Roach, yes, I agree. It is, in addition, not enough for a man buying a stock to say "I think the price of the stock will go up". Without asking WHY he thinks it will go up, and further considering whether that reason is a human reason for profit, he may be little better than a fence for stolen goods. If the price is going to go up because the company is about to lay off a bunch of people to increase its profit margin by .1%, or if it is about to announce shifting manufacture to Honduras where they can pay labor 1$ per hour, then these are not human reasons for the profit he hopes to realize. If, instead, he thinks the stock price will go up because they have discovered a new way to make the same product with less waste, or with cheaper metals that are just as strong, then yes, this is a profit consistent with human endeavor. It would be nice if there were a mechanism we could overlay upon the stock market that encouraged human motivations for profit and discouraged profit-for-mere-profit's sake, without interfering with the efficiency of the market for finding the best supply & demand match-ups. Usury is the institutionalization of greed. Since this whole thing originates with loans and lending practices that proved impossible for individuals to pay-off, and encouraged lenders to pass-off and "hedge" against, usury is the accurate term. Usury is the institutionalization of greed. Interesting theory. It is surely one way to institutionalize greed. Aren't there lots of other ways? Like the lottery? Aren't there lots of other ways? Like the lottery? "The holy-rollers scapegoating my client are hypocritically neglecting the warped incentives, disgraceful compensation packages, misleading claims and arcane rules surrounding Bingo that have led to the loss of homes, jobs, pensions and impoverishment of countless innocent and vulnerable parishioners. And still the law looks the other way, cowed by the unchecked and insidious influence that the Church holds over the very regulatory agencies and legislative bodies designed to protect us." uuummmm, is this supposed to answer the question? If usury is just one of the ways to institutionalize greed, what is it in this case that makes it usury? Where were the excessive interest rates that people were oppressed by? Extortion rackets, bribery, fraud, and systematic theft are also ways of institutionalizing greed. Are they also usury? Where were the excessive interest rates that people were oppressed by? When the ARM's adjusted upwards to 7% they became excessively high for those who began at 4%. I suspect banks saw the unproductive nature of these loans which is why they packaged them as CDO's and pawned them off on other institutions without wanting state regulators to oversee the insurance vehicles that helped underwrite the ongoing scheme of handing off toxic loans. It truly was a Utopia of Usurers for awhile. Still, if you have a universally accepted figure that fits the definition of excessively high, perhaps it can be crafted into the "reform" package that Wall Street will now craft. Kevin, I think the point is that you seem to be employing the term usury as simply another in stock of terms of abuse for the current state of things, while I am trying to give it explanatory content, and what's more explanatory content that is useful. Paul, I am responding to Tony's narrow definition of usury as the act of lending money at an unreasonably high interest rate and not employing your understanding since he apparently rejects it and you can make the better case if you are so inclined. However, even accepting his definition, usury is at the root of this debacle because sub-prime borrowers received loans that would balloon above rates they could afford. I have yet to hear anyone contend that sub-prime loans would grow to 1/5 of the residential lending marketplace if lenders had to retain these mortgages on their balance sheets. Sounds like usury to me. I agree that Tony's cited definition is far too narrow. But I worry more about your extraordinarily broad definition the institutionalization of greed. I not even sure I know what that phrase means. More pointedly, I'm not sure that greed is the truly operative sin here. It might have played second fiddle to, for instance, what I have called "morbid optimism." Sure many thousands were in this usurious economy because they simply coveted wealth, made an idol of it; but many more were in it out of a superabundance of optimism. Presumption is the sin, perhaps. Wealth was not a constant goad to them; but the optimistic spirit sure gave them leave to continue to expand luxuries without a care for the tomorrow; and what point is there for gratitude and prudence if housing equity will increase forever by the very nature of things? Here is what I mean by the institutionalization of greed; when the contractual exchange among self-interested individuals is indifferent to the objective good of the person. That is the operating principle for our economic system and it came to full fruition in this mess. Compensation plans that rewarded risk, while negating the liability of probable defaults, were a new innovation. Moreover, the flight into abstraction is a sophisticated form of avoiding moral responsibility, as any teenage boy will admit. And, as discussed so often before, abstraction was such a benevolent master, that the human person became less an actor, than a fortunate recipient happily ensconced in a haze of technological marvels and computer generated windfalls. Having said that, I do not believe that "thousands" were aware of the true nature of the ride they were on, yet that is a tragedy all its own. Power resided in too few hands and real knowledge in even less, which is truly frightening as it does not bode well for the future of self-government. You say the optimistic spirit was the engine for the frenzy, but I don't think that true of those few who consciously inflated the housing bubble from their perches at the Fed, Treasury and Wall Street. Something akin to despair, or at least desperation drove their decision to compensate for a 30 year long decline in real wages by turning our homes into ATMs. I don't know what they have in mind next as the middle class bears the brunt of globalization and the yolk of public and private debt, but they better accept that economics is a moral not a natural science for starters and we all collectively should ask question; what are people for? When the ARM's adjusted upwards to 7% they became excessively high for those who began at 4%. When I got my first home loan in the 80's, at just over 10%, nobody at the time was saying this was usurious. Since the inflation rate at the time was about 6% or a little more, the effective rate of interest was just over 4%. That is the same effective rate my Dad paid for a house mortgage in 1953. In 2005, a person with good credit could get a 30-year fixed mortgage at 6%, which was about 4% above the inflation rate. A person with non-stellar credit could get a fixed 30-year mortgage at 7% to 8%. Are you telling me that an ARM sold to a person with substandard credit starting at 3% and eventually rising to 7% or 8% was usurious? When the fixed rate for the same person was in the same range? That doesn't make any sense. Unless 4% above inflation with good credit, and slightly higher for less perfect credit, is usurious, then the rates themselves were not rates consistent with usury. I am open to considering that the scenario involved usury in some more subtle manner, if only someone would make the case. Paul, I agree with you that an optimism that surpassed rational (and moral) bounds was deep down in the roots of the problem. We have all been taught that "progress" and "advancement" and "better standard of living" is the American way. Anyone trying to tell me that I should not hope for a better life for my kids than I got is defeating that dream. So the natural American proclivity is to an unbounded optimism about material wealth - even when that wealth is pure fiction. At the same time that real production of wealth has been leveling off or even tapering downward, people's expectations continue to grow: the "average" house size is about twice as large as my parent's house was when purchased, just as an example. The mortgage crisis had lenders using that proclivity to convince people who could not afford such housing that they could afford it. "You deserve it" is the rallying cry of Madison Avenue, found in commercial after commercial. These people took the bait, because somewhere along the way they allowed the "you deserve it" mentality to seep in, and allowed the "you can afford it" temptations to overwhelm their common sense. Isn't it true that "you deserve it" is simply a way of spreading a form of envy? And that "you can afford it" is a snake-oil technique of fostering greed? Are you telling me that an ARM sold to a person with substandard credit starting at 3% and eventually rising to 7% or 8% was usurious? Of course, if lenders thought sub-prime borrowers could afford 7% they would have offered loans with that rate at the beginning of the terms of the loan to a market segment that has double the default rate of those with good credit. Or our you say the ARMs were a form of gift and generosity? Worse lenders had the added incentive and protection of being able to package these mortgages off as obscure investment vehicles and not face the consequences of their decisions. So much for personal responsibilty. Of course, if lenders thought sub-prime borrowers could afford 7% they would have offered loans with that rate at the beginning of the terms of the loan to a market segment that has double the default rate of those with good credit. Or our you say the ARMs were a form of gift and generosity? So what you are saying was that the evil was in structuring the loan (that the borrower could not afford) in such a way that the borrower could manage to ignore the fact that he could not afford it. If the lender had the loan start out at the 7% or 8%, many fewer of the borrowers would have taken those loans (many fewer would have qualified), but the fact that those few would be paying 7% to 8% would not have use crying "usury". So the structure was evil in the disguise. Snake-oil salesmanship. The fact that a borrower who cannot afford 8% is offered a loan that is (or, eventually will be) at 8% simply has nothing to do with whether that rate is an excessive rate. Some borrowers cannot afford a 0.5% loan. Does that mean a bank that offers them a loan at 1.5% is usurious? Of course not. “None of them knew,” says one trader. Which sounds, in retrospect, incredible. But an entire financial system was premised on their not knowing—and paying them for their talent! Lewis nails it. Our economics at their most refined where the self becomes a passive spectator and well-rewarded beneficiary to a purely rationale system. Relieved of intellectual discernment, prudential judgment and moral responsibility, but enriched nonetheless. Sweet. “For what faith really states is precisely that with Jesus it is not possible to distinguish office and person; with him, this differentiation simply becomes inapplicable. The person is the office, the office is the person. The two are no longer divisible. Here there is no private area reserved for an ‘I’ which remains in the background behind the deeds and actions and thus at some time or other can be ‘off duty;’ here there is no ‘I’ separate from the work; the ‘I’ is the work and the work is the ‘I.’” Josef Ratzinger Introduction to Christianity. I like that you are bringing back consideration of the word "usury" and how it works today.